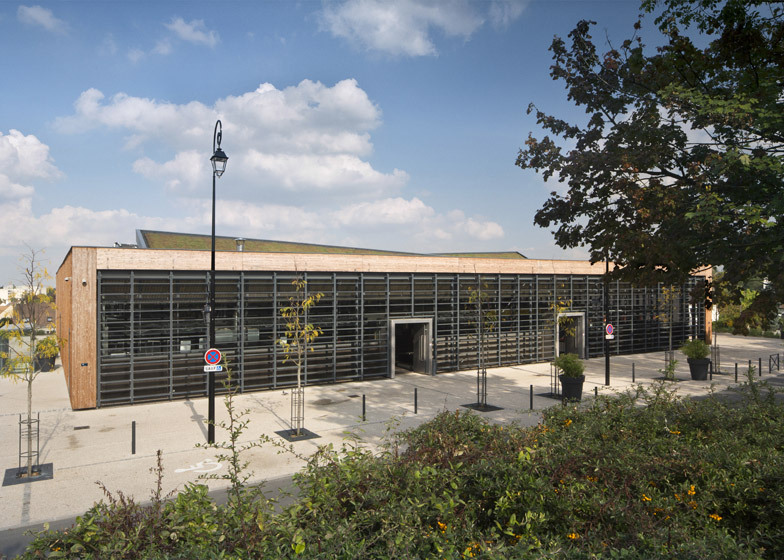 Wooden louvres and green rooftops make up the exterior of this market hall outside Paris by Ameller, Dubois & Associés, while inside is a dramatic ceiling that combines angles and curves (+ slideshow). 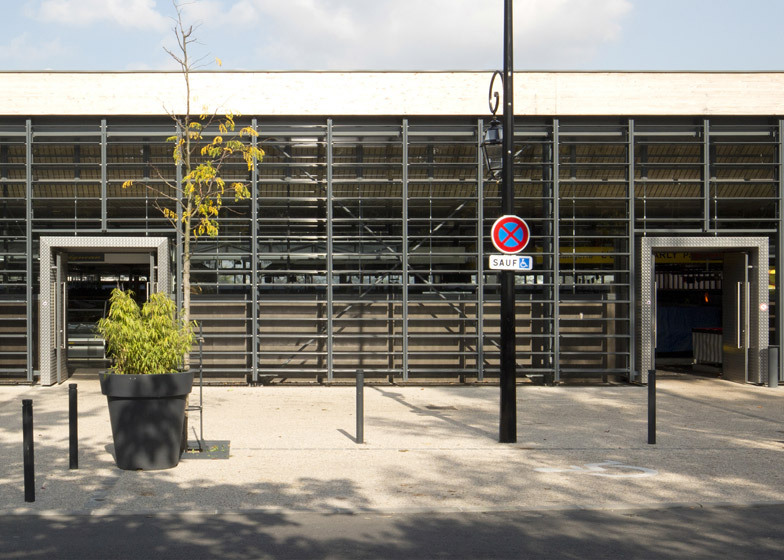 Located in Marly-le-Roi, a community in the western suburbs of Paris, the project involved renovating the existing covered market – adapting the layout and bringing in more light – as well as increasing car parking provision and improving the surrounding landscaping. 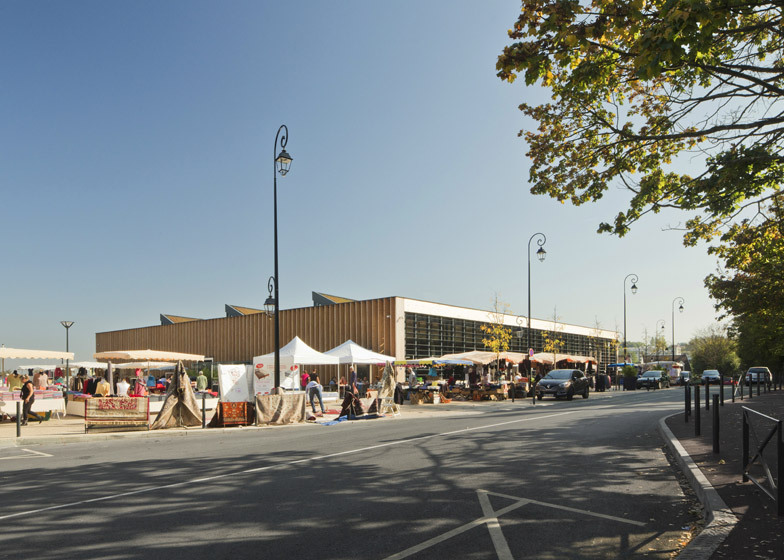 "The market hall is situated in an exceptionally central location in Marly-le-Roi, surrounded by houses and overlooked by the railway," said French studio Ameller, Dubois & Associés in a statement. 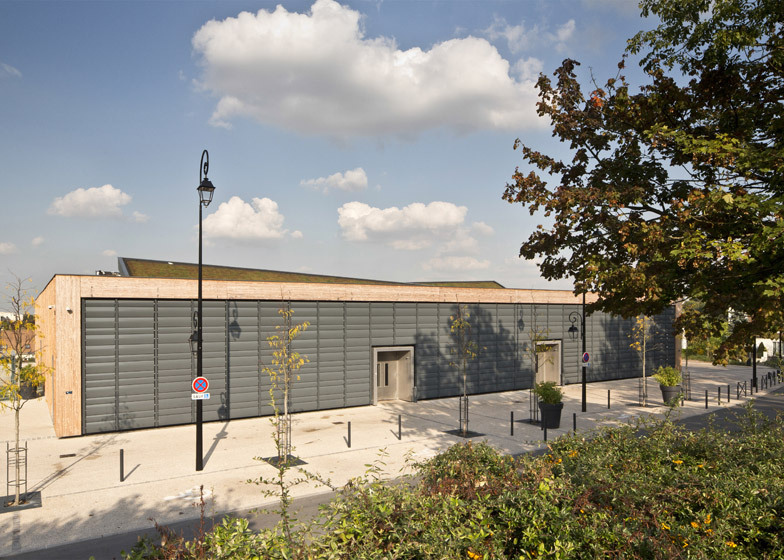 "Its design comprised a dual challenge: to create an attractive building, likely to bring about a lively neighbourhood and fit into a very landscaped environment, despite the presence of plenty of parking." 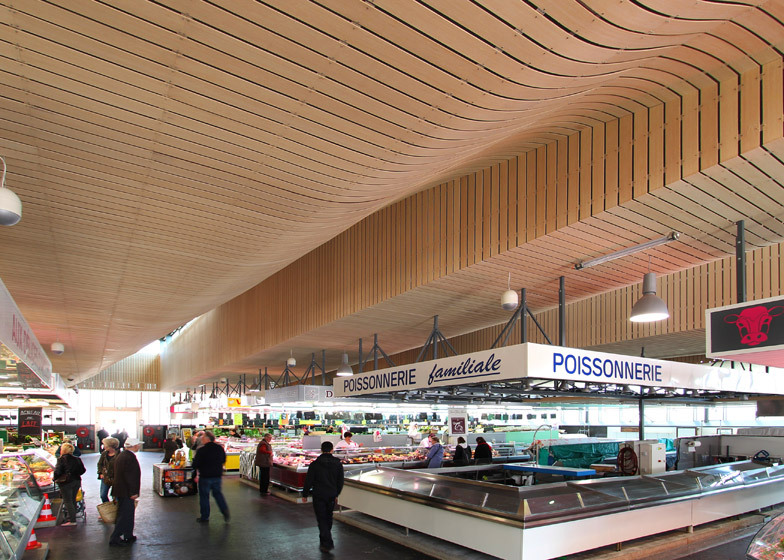 The walls of the market hall are glazed and are screened by either wooden and metal louvres, dependent on the orientation. Wooden louvres are arranged vertically along the east and west sides, while metal louvres run horizontally along the south facade. 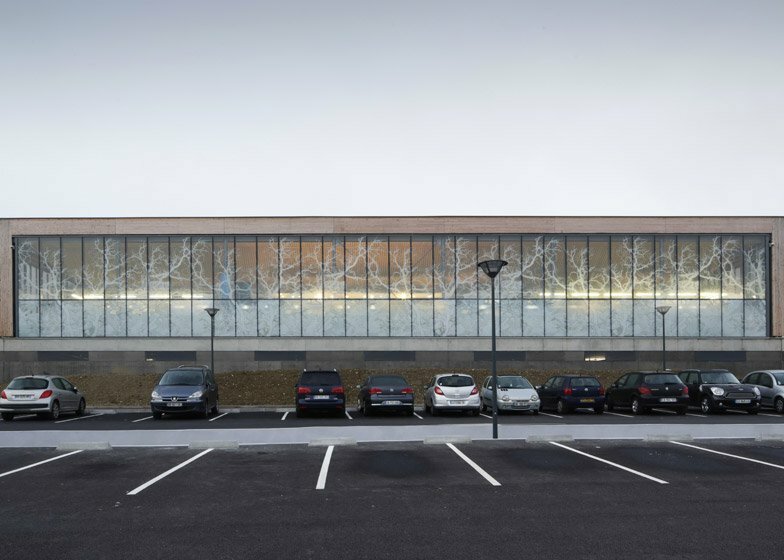 The north elevation is left exposed, but the glazing has been decorated with tree motifs. 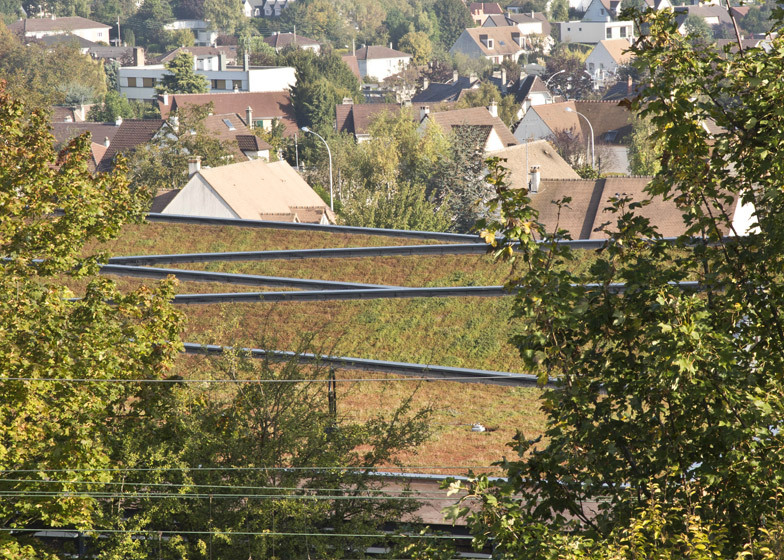 The architects also restructured the roof of the building to create a series of angled fins, all covered in greenery. Where these lift up, clerestory windows have been added to bring extra light down into the centre of the hall. 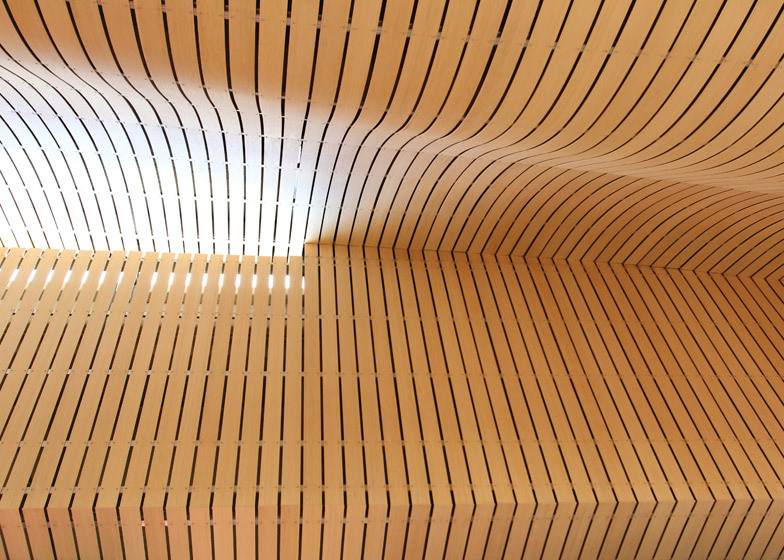 This new structure creates an unusual ceiling, formed of both undulating curves and sharp angles. 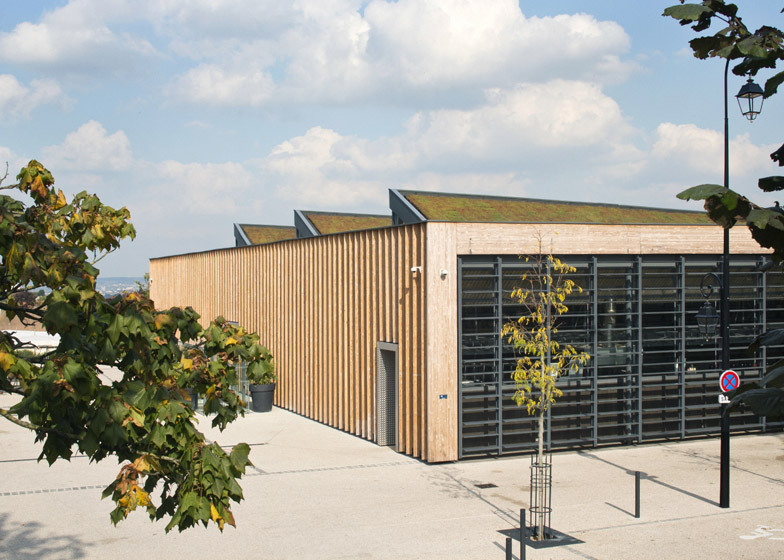 Covered in timber, it offers soft acoustics for the space. There are no columns inside the hall, allowing for a flexible layout that mostly follows the rises and falls of the ceiling. 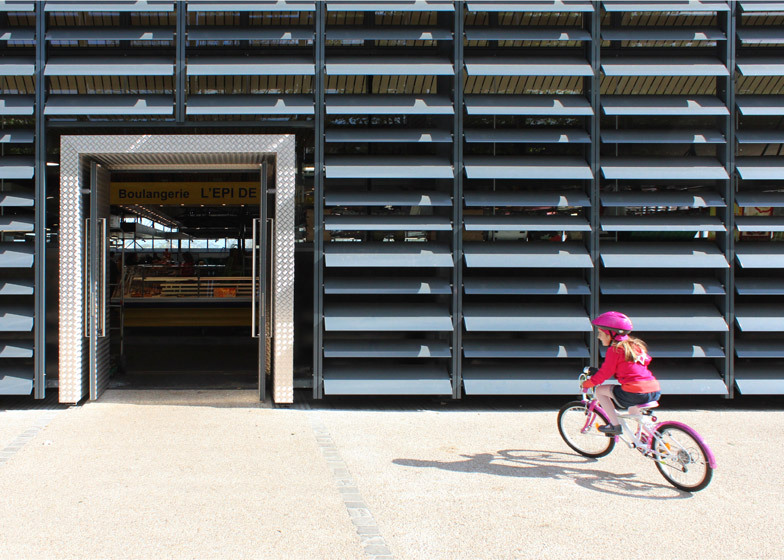 Permanent stalls are arranged in a regular grid, with generous walkways in between. 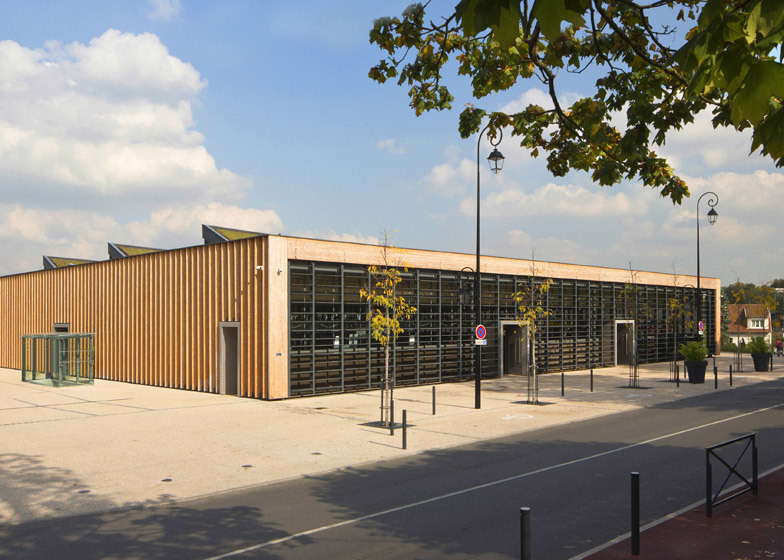 A new basement floor extends beyond the limits of the building to create car parking, and can be accessed using staircases and elevators located both inside and outside. To bring daylight into this space, there is also a sunken patio filled with tall trees, flowers and mineral stones. 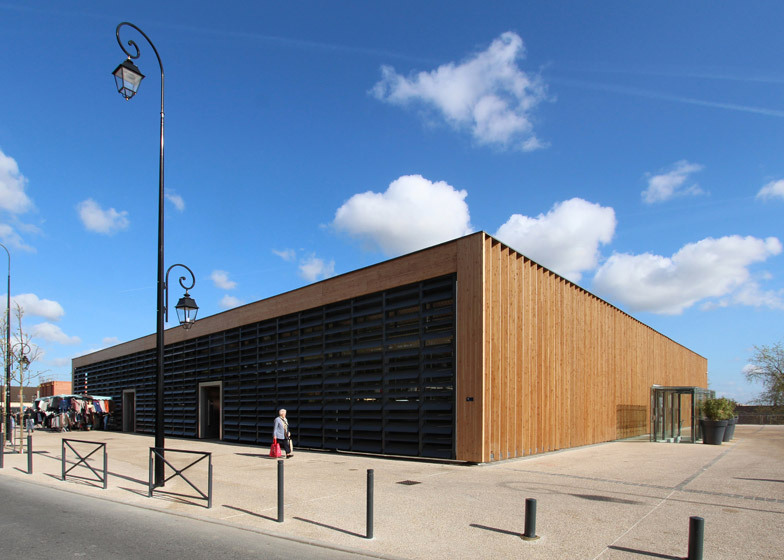 An extra timber-clad building in the south-east corner of the site accommodates staff offices and toilets, while a spare patch of land on the western side of the site is earmarked for housing, also designed by Ameller, Dubois & Associés. 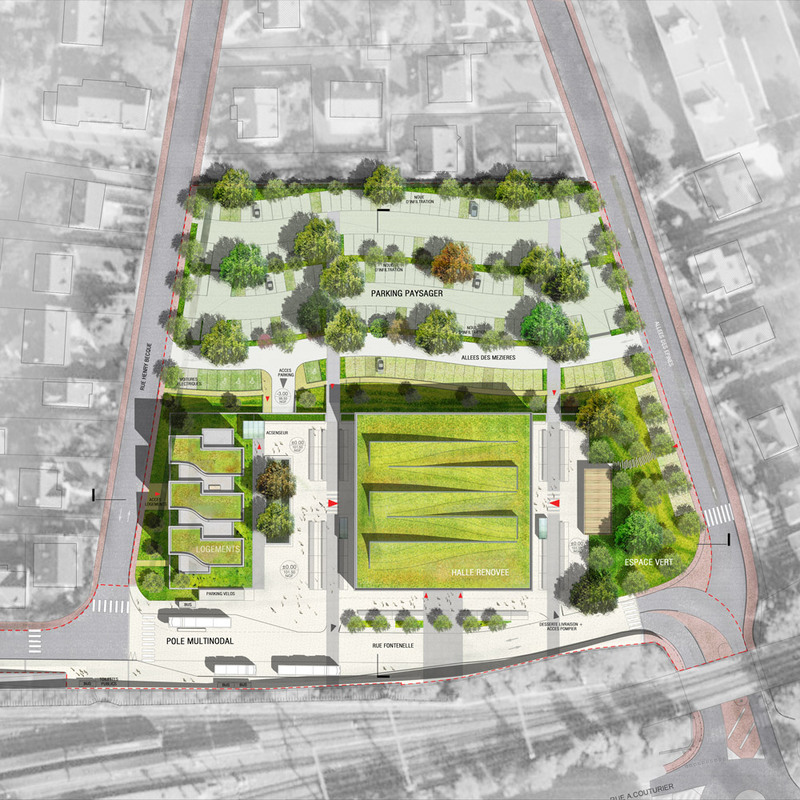 "Achieving these twelve housing units is not an integral component of the project. 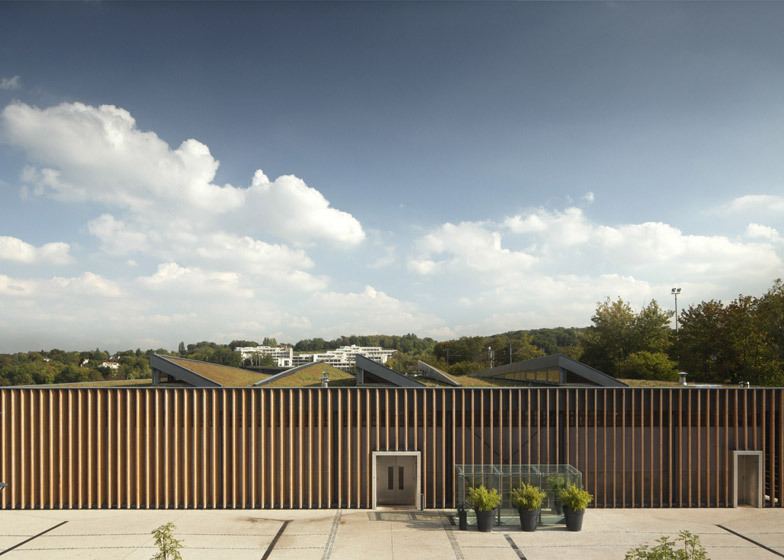 It is nevertheless an important issue, given its presence in the western boundary of the site," added the studio. Photography is by the architects apart from where otherwise indicated. Team: Philippe Ameller, Jacques Dubois, Camille Henry, Catherine Laroche and Hélène Martin.